Blizzard Considers Creating Its Own "Pixar University"
The studio behind World of Warcraft (et al) has considered creating an in-house "university" to train a new generation of game designers. 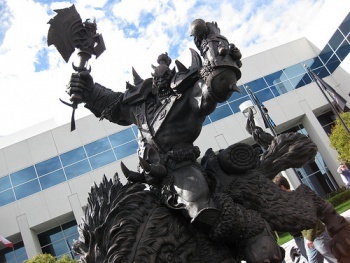 Blizzard Entertainment can afford to be selective with who it hires these days. Known for its perfectionist attitude, the respected PC developer wants the best talent it can find to work on games like Diablo III and the enigmatic Project Titan. According to Blizzard's Frank Pearce, however, good help is hard to come by. "Specific projects aside, the talent pipeline has always been one of our biggest challenges," Pearce told Gamasutra. "So we've got a presence at GDC, to find some good talent, and we're trying to figure out ways where we can nurture and grow some of our own talent internally." One possible solution that the Irvine, California-based studio had considered, said Pearce, was to follow in the foots of respected 3D animation house Pixar and set up a Blizzard-owned school to train potential talent - its own Pixar University. "We're talking about what the Blizzard equivalent would be to Pixar University, if we can do anything like that to try to grow talent," Pearce said. "...Obviously, a project and vision of that magnitude would have to be something that was built over the course of years. That's not something you can put together in weeks or even months." This isn't the first time that Blizzard has been compared to Disney's famous CGI branch - Pixar technical director Andrew Payton said that he saw more than a few similarities between the two studios last July. "Blizzard and Pixar almost seem like mirror images of one another: The same sort of philosophy; the same sort of work ethic; the same attention to detail," said Payton. "They're basically the biggest company in the games industry, and we're the biggest company in the 3D film industry - it's interesting talking to them, because we always come across the same sort of problems and it just comes down to the philosophy of what you're trying to do." Pearce said that Blizzard already devotes considerable resources (and it's not like it doesn't have cash to burn) on training current employees via its /learn program, where internal - or external - experts hold sessions and seminars for the rest of the company to improve its skills. I don't know about you, but I'd totally have gone to Blizzard University if I'd had the option. It's the only school where "Jim's having a party Saturday night" means "We're running heroic dungeons and need a tank, want to come?"